Lock in a great price for Under Canvas Zion – rated 9.1 by recent guests! Exceptional site on a hill facing sunrises. Tents and beds are very comfortable and beautifully simply furnished. I like that you can park the car next to your tent. Communal bathrooms are cleaned and close by tents. Location is perfect about 10 miles to the entrance to the Zion National Park, and right at the edge of the entrance to the Kolob Canyons. The accommodations were comfortable and menu items were good. Beautiful scenery. We loved the entertainment (Many Miles) at dinner and the complimentary campfire with s’mores! Our kids also loved the hot chocolate bar too. The dinner was fantastic and the views are amazing. We were here on our honeymoon and had traveled from the Grand Caynon to Bryce and then here to Zion. The views, staff, accommodations and food were top notch. Always had a clean restroom, food was delicious each time and our cabin was cleaned and stocked with fire wood daily. Everything exceeded our expectations. This place was so exciting! Its amazing waking up with this amazing view! The tents were very confortable! Where to begin! Under Canvas is hands down one of the best lodging experiences I've had in my life. Everything from the tent, service, food, location and cleanliness is 5 stars. My entire family said our breakfast and dinner were the best meals of our trip. The tents themselves are pristine, modern and welcoming. The bed was SO comfortable - we all had a tough time waking up in the morning! We upgraded last minute to tents with stoves due to the frigid overnight forecast - great decision. All the staff at the camp was informative and friendly. The location is absolutely jaw-dropping. If you're looking to disconnect, recharge, enjoy quality time with your travel companions and take in the great outdoors without giving up comfort......go book Under Canvas! We are so blown away with our experience we are planning our next family trip around a second location. We loved this place! Friendly staff, beautiful location, comfortable amenities. The bed was comfy after a long day of hiking! We got engaged and they upgraded our room to congratulate us!!!! 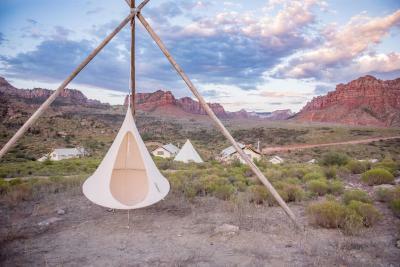 Take glamping to a whole new level with a stay in these luxury tents under the stars at Zion. Located on 196 acres bordering Zion National Park, Under Canvas Zion offers a unique lodging experience just as incredible and unique as the park itself. 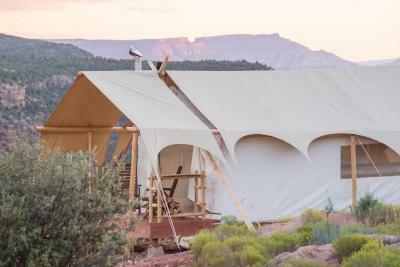 The camp seamlessly blends in with its dramatic surroundings (the majestic red rocks that make the park so famous) and the three options of luxury tents allow guests to enjoy Utah's spectacular desert without giving up the comforts of home. There's plenty to explore within the park, whether rock climbing, biking, cayoneering, hiking, safari tours, horseback riding, hot air ballooning, helicopter tours, kayaking or UTV/ATV guided tours. On-site massages and yoga sessions are also available to guests and an American or vegetarian breakfast is available every morning. This property also has one of the top-rated locations in Virgin! Guests are happier about it compared to other properties in the area. This property is also rated for the best value in Virgin! Guests are getting more for their money when compared to other properties in this city. When would you like to stay at Under Canvas Zion? Featuring an above bed window for stargazing and private bathroom, this tent has a wood burning stove, deck, and 2 solar lanterns with USB ports. Towels, linen and toiletries are provided. Featuring a private bathroom and a seating area with a sofa bed, this tent has 2 solar lanterns with USB ports and a wood-burning stove. There is also a deck with outdoor furniture. In the tent you will find hardwood floors, linen, towels and toiletries. House Rules Under Canvas Zion takes special requests – add in the next step! Under Canvas Zion accepts these cards and reserves the right to temporarily hold an amount prior to arrival. Nothing really but communal space could have better seating/ furniture. Too many families with children--very noisy. This was not the relaxing, quiet getaway I was looking for. Would like better internet access. I love the whole concept of canvas/tents in a beautiful layout with mountain background. The views are breathtaking. I came with my three girls ages 7,9, and 11. I had a ultramarathon and it was a perfect spot to be. My girls loved running around. They also had some cows that keep there distance, while we had s'mores during sunset. It was very windy the night we stayed and we weren’t sure if we were safe due to the flapping of the tent so we woke up often. If this is normal to have it be very windy at night, then a warning at check in would have eased concerns and allowed us to sleep more peacefully. Adding a pool would be wonderful for kids. - Nothing too bad, but for those of you who are nubes at lighting fire and getting the fireplace going, get some practice done before you head there. - It got super cold at night which we were told was unexpected, we had to keep getting up in the middle of the night to fix the fireplace - for those with long hair like myself, there is no electricity, hence when you wash your hair, you'll have to dry it over the fireplace, this will take an hour or more (I have very thick long hair), and you'll get a lovely smokey smell on your hair when your done. - no bottled water provided in the tent. If we were informed we would have prepared this ourselves, we understand the property is trying to be more eco-friendly, but perhaps providing a flask so we can refill our water would be a good idea. - As mentioned it got very cold, it would be nice to have a hot water bottle provided for a super chilly night. - Something needs to be done about the wet floor at the shower and the toilet. The bath mat provided did nothing, the toilet area gets wet as well, and on a very cold night you'll freeze your feet off if you don't dry it out properly, we had to sacrifice one of the towels. The view was fantastic both day and night, We arrived at night and we could see millions of stars and shooting stars it was pretty magical. In the morning when we woke up, we were surrounded by beautiful mountains and all that mother nature has to give. The only issue we had was rather slow food service for breakfast. I understand kitchens can get backed up however we were one of two tables ordering food that morning. I think this is an area of growth for the property but this did not take away from our experience. Beautiful location and unique experience. Catered for everything...ice complimentary tea and coffee and hot chocolate and smores around the fire. Live music too was such a great experience.